The Lakers have lost seven of their last nine games at Staples Center, but will play just one home game in the next 22 days. LOS ANGELES (AP) — Ty Lawson had 20 points and 12 assists, Timofey Mozgov added 20 points and seven rebounds, and the Denver Nuggets beat the slumping Los Angeles Lakers 137-115 Sunday night for their second straight win after an eight-game skid. Nate Robinson scored 21 points, while Wilson Chandler and Kenneth Faried added 17 apiece as the Nuggets dropped 77 points on the Lakers in the second half. Denver emphatically earned a win for coach Brian Shaw in his first game back at Staples Center to face the Lakers as a head coach. The longtime Lakers guard and assistant coach was passed over for the top job in Los Angeles after Phil Jackson’s departure. Pau Gasol had 25 points, 10 rebounds and five assists amid another round of trade rumors with the injury-battered Lakers, who have lost seven of eight. Seven Nuggets scored in double figures in their fifth consecutive win over Los Angeles, scoring the most points by any Lakers opponent this season. Fourth-string point guard Kendall Marshall had nine points and a career-high 17 assists in his second straight start for the Lakers, who are without Steve Nash, Steve Blake and Jordan Farmar due to injury. Los Angeles has lost seven of its last nine games at Staples Center, but will play just one home game in the next 22 days. Denver easily took control with a 17-2 run early in the fourth quarter, remaining unbeaten against the Lakers since November 2012. 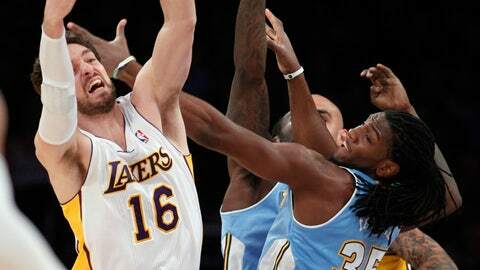 The Nuggets hit 12 3-pointers, while the Lakers went 3 for 21 on long-distance shots. Robinson defiantly rubbed it in with 2:37 to play, deliberately getting a technical foul for hanging on the rim after a dunk that put the Nuggets up by 24 points. Gasol responded to the latest spate of trade rumors surrounding him with an outstanding effort against the Nuggets, putting up 15 points, six rebounds and five assists by halftime. The 7-foot Spaniard has been sought by Cleveland in recent days for what essentially would be a money-saving move by the wealthy Lakers. Los Angeles’ chances of a playoff run are already waning in the continued injury absence of Kobe Bryant, who expressed dismay about the latest uncertainty around his 7-foot Spanish teammate before the game. "I’m sure there’s a lot of frustration inside of him," Bryant said of Gasol, his right-hand man on championship teams in 2009 and 2010. "But he does a great job of being professional and keeping it in, and going out and playing." The Nuggets played their third straight game without veteran point guard Andre Miller. The Los Angeles native is on personal leave until Monday after clashing with Shaw on the bench Wednesday night. NOTES: Dozens of Auburn football fans watched the game from Staples Center’s lower bowl on the night before the BCS championship game at the Rose Bowl. A luxury suite full of fans chanted slogans and held up an orange banner reading "War Eagle." … Lakers C Robert Sacre needed five stitches to close a cut on his lower lip late in the first half. … Eddie Murphy, Jessica Alba and Mark Wahlberg attended the game.